It's Bastille Day, so where else are going to turn to but the country of France? Now, we've already looked at The Tricolor itself (and there's really not much more you can say about one of the most iconic flags in the human history- and yes, I'm comfortable putting it right up there with the most important of them) but France has plenty of regional flags that are worth taking a peek at as well and that's where we're going This Week In Vexillology... a delightful trio of French regional flags. Brittany is the administrative region of France that juts out the most to the west... if you can find Normandy on the map and move southwest, the peninsula you're going to hit is Brittany. The name of the region is derived from the settlers from Great Britain who fled the Anglo-Saxon invasions between the fifth and seventh centuries. As a result, it's maintained a lot of it's Celtic heritage, including a language (Breton) that has more in common with Welsh and Cornish than with French. Plus: how cool is that flag? First created in 1923 by Morvan Marchal who drew inspiration from the flags of the United States and Greece, who were seen as symbols of liberty and democracy at the time. The nine horizontal stripes stand for the traditional dioceses of the duchy. The black stripes are for the French speaking dioceses of Dol, Nantes, Rennes, Saint-Malo and Saint-Brieuc and the white stripes are for the Breton speaking dioceses of Tregor, Leon, Cornouaille and Vannes. The symbols in the canton (which I guess are ermine?) recall the arms of the Duchy of Brittany. A former administrative region of France, it was merged with the neighboring region of Rhone-Alpes to become Auvergne-Rhone-Alpes in January of 2016. Where is it on the map? Well, find the southern city of Montpellier on the map (it's just west of Marseille) and head north until you hit Clermont-Ferrand. Then, you're in the heart of Auvergne. Historically, this region is worth nothing because it was the home of Vercingetorix and his tribe, the Arverni, a powerful Gallic tribe that defeated Julius Cesar in 52 BC before eventually being defeated by the Romans. The flag itself is an armorial banner- the official designation is, "or a gonfanon gules ringed and edged vert." There doesn't appear to be an explanation of the arms, it's said to stand for the a banner used by Eustace III, the count of Auvergne when he seized Jerusalem in 1099. Let's start with the obvious: where the heck is it? Well, it's nestled right along the border with Switzerland- if you find Bern and head northeast until you get to Besancon, you've found the Franche-Comte. It got merged with Borgogne in January of 2016 to become Bourgogne-Franche-Comte. Literally the name means 'Free Country' and it's been around for centuries- either as part of the neighboring Kingdom or Duchy of Burgandy or as it's own entity. 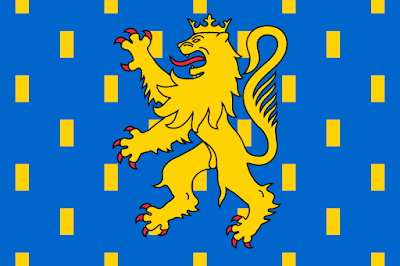 Another banner taken from heraldry, it depicts: "on a field of azure seme with bars of gold, a crowned lion rampant with tongue and claws gules." (Whatever that means... ugh, again, heraldry is something I'm going to have to sit down and learn I guess.) It's derived from a blazon that was created in the Middle Ages by Otto IV, the Count of Burgandy to replace the eagle, which was formerly the symbol of Burgandy. Otto wanted to change the symbol to reflect a closer relationship with the Kingdom of France. And there you have it! Three flags of France for Bastille Day! Until next time, keep your flags flying, FREAK or otherwise!